Federal and state emergency declarations relaxing hours-of-service rules for haulers involved in the relief response to severe flooding in the Midwest remain in effect. The Federal Motor Carrier Safety Administration declared a month-long state of emergency for: Arkansas, Illinois, Iowa, Kansas, Kentucky, Louisiana, Minnesota, Mississippi, Missouri, Nebraska, Ohio, Oklahoma, South Dakota, Tennessee, West Virginia and Wisconsin. “This emergency declaration provides for regulatory relief for commercial motor vehicle operations while providing direct assistance supporting emergency relief efforts transporting supplies, equipment, fuel and people into and from the affected states or providing other assistance in the form of emergency services during the emergency in the affected states from severe flooding,” the declaration states. Snowmelt and a late-winter rainstorm caused flooding in most of those 16 states, inundating roads, killing animals and soaking harvests on farms across the region — many already dealing with low crop prices and the U.S.-China trade war, as well as fallout from arctic cold earlier this year. Missouri River floodwaters in Sioux City, Iowa, hovered at 21 feet as of March 27, according to the National Weather Service. NWS predicted additional rainfall this weekend will threaten areas that already are experiencing flooding. The Missouri River is forecast to swell to 22.2 feet in Sioux City. The emergency declaration, made March 19, will remain in effect for the duration of the emergency or until April 18, whichever comes sooner. FMCSA’s notice grants exemption from Parts 390-399 of the Federal Motor Carrier Safety Regulations, which cover parts and accessories needed for safe operation, hours of service and longer combination vehicles. Drivers are not exempt from requirements relating to commercial driver licenses, drugs and alcohol, hazardous materials, size, weight and registration requirements. According to the notice, “direct assistance” terminates when a driver engages in interstate commerce to transport cargo that doesn’t relate to emergency relief efforts, or when a dispatcher sends a driver to another location to begin engaging in interstate commerce. “If the driver informs the motor carrier that he or she needs immediate rest, the driver must be permitted at least 10 consecutive hours off-duty before the driver is required to return to the motor carrier’s terminal or the driver’s normal reporting location,” under the declaration. Some states have lifted similar regulations for drivers providing emergency relief. Nebraska Gov. Pete Ricketts issued an executive order March 20 lifting certain HOS restrictions for drivers delivering supplies or hauling away debris and dead livestock. The order expires April 15. According to the Nebraska Emergency Management Agency, damage assessments are still taking place as floodwaters begin to recede. By March 24, the Nebraska Department of Agriculture had logged 186 donations for such items as fencing, hay and animal feed. More than 1,300 miles of highway have reopened, leaving 258 miles still closed. “In light of the historic flooding and devastation our communities have experienced, the governor’s office is working to cut red tape,” said Taylor Gage, spokesman for the governor’s office. Iowa Gov. Kim Reynolds estimated flood damage to her state at $1.6 billion. She issued a statewide proclamation allowing truckers hauling relief supplies to increase their weight to up to 90,000 pounds from the standard 80,000. The proclamation remains in effect until April 24. Kansas Gov. Laura Kelly signed a similar executive order March 21, suspending regulations pertaining to licensing, certification and fuel tax permits for motor carriers hauling supplies and equipment. The order expires April 19. 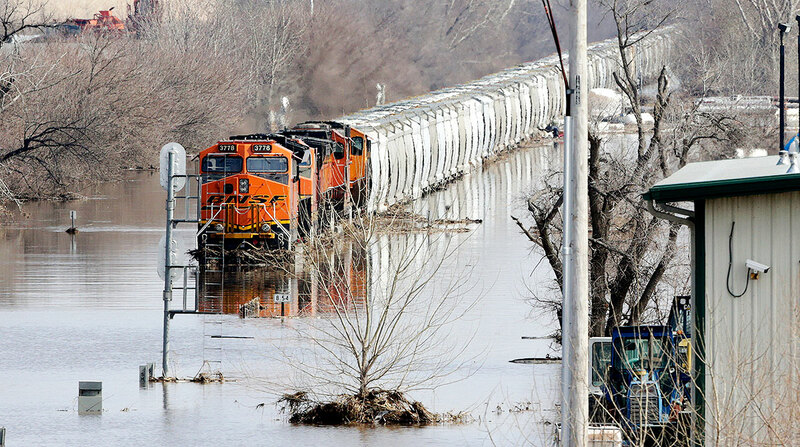 Kansas toes the Missouri River, which NWS reported had swollen to 31 feet in Kansas City on March 27.